Pinterest has moved yet another step towards helping marketers market brands. The social network has begun sending out emails to users reminding them about brands whose content they have pinned. These emails go so far as to notify users about items pinned that have now gone on sale. About three months ago, I pinned a rug I found on Crate and Barrel’s website. I was shopping for rugs to put in my new apartment (which I am still looking for). This morning, Pinterest emailed me about this pin, telling me the price of the item dropped. Pinterest is now emailing users about products they’ve been that are now on sale. 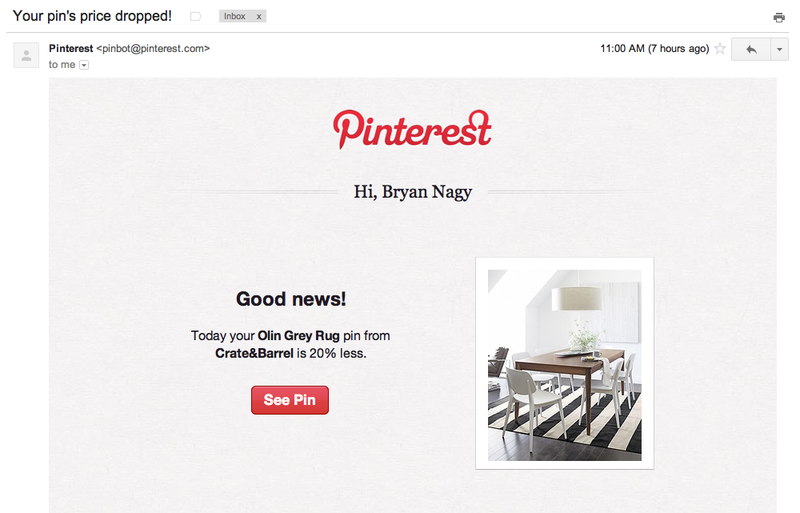 When I clicked on the pin in the email, I was taken to the pin of the rug I made on Pinterest. Underneath the pin, I was able to see that the price of the rug was in fact dropped, and even listed in red in case I wasn’t sure. Rich Pins allow consumers access to information about pinned products. How is Pinterest doing it? The latest emails were developed using Pinterest’s rich pins. Pinterest released these special pins a few months ago. A brand adds special meta tags on their website, which allows Pinterest to pull in information about a product when it is pinned by a user. Information can include whether the product is in stock, what the price is, and (as we experienced above) if the product is on sale. Once these pins are approved by Pinterest, this information is automatically updated for each product pinned by users. The result is a smart way for brands to pass back important information to users that otherwise would be lost if a user doesn’t click on the pin. What does this mean for Brands and Consumers? For brands, Pinterest sending out emails about products users have pinned is extremely exciting. It means reminding consumers about past products they viewed and showed purchase intent for in the form of pinning the product on their Pinterest boards. By becoming top of mind again to the consumer, the chance of converting this intent into a purchase increases. The result is increased brand communication and likely increased sales. For consumers, these emails provide value in the form of information. With the rug I pinned, I was actually excited to see the email and learn that the product I liked was now on sale. Not only did this drive me to consider purchasing the product, it drove me to the company’s website yet again, causing me to look at even more products. All in all, Pinterest is moving in the right direction with these emails. They not only help out brands, but also consumers. It should be interesting to see what comes from this move, especially considering the upcoming holiday season.